In my last post I laid the floating subfloor. 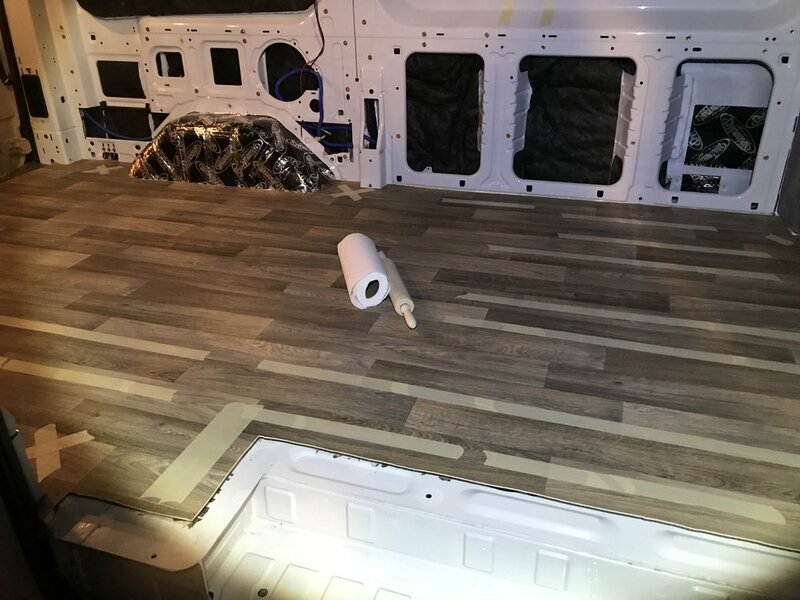 This is three plywood sheets cut to fit the shape of the van which are screwed in to batons secured to the floor of the van with 3M 4200 Marine Adhesive. Between the batons and the plywood sheets there's a thin underlay to provide a small amount of noise, heat & sound insulation. Since the last post I decided to upgrade the side and rear entries by buying the plastic entry trims. As a result I needed to cut back the subfloor at the rear. The top plywood was easy but 3M 4200 does an outstanding job of securing plywood to metal so trimming the battons was a dirty job. In the end I found dousing the adhesive in isopropyl alcohol and then rubbing very thoroughly with a rag was the best way to clean up. This is a straightforward but time consuming task. First I laid out the vinyl in an quiet car park, laid the ply boards on top and made a very rough cut all around. I left at least an inch of extra to be trimmed in place. When rolling the trimmed vinyl back up I was careful to clean any debris from the back. Ideally I'd have laid everything out on a sheet. Now that the vinyl can be laid in the van the real work begins on carefully trimming around all of the small intrusions into the van. In a Transit these are numerous: the wheel arches, front and rear pillars as well as two central access points on either side. For this I used both a good, sharp craft knife as well as high quality shears. Be careful not to mark the van or floor with the knife/shears but most importantly repeated smaller cuts are better than larger ones. 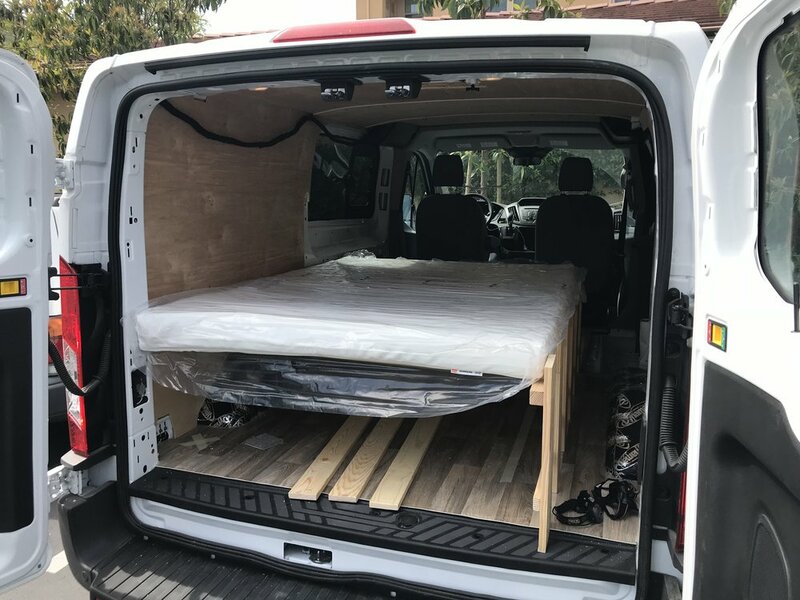 Be careful to keep going and checking other areas of the van as it is surprisingly easy to move the whole vinyl sheet before a minimum amount of trimming to fit has been done. Polyfilling is a straightforward job but takes some time as for screw holes you need to polyfill, wait for the polyfiller to thoroughly dry and then fill again. It should be possible to fill in the morning and again in the evening but I needed to wait a day between fills. I also used a lot of filler where the boards abutted each other. There were minor height differences despite being screwed into the floor, however I was able to make these differences much smoother. I believe this improved the appearance of the finished vinyl so well worth the effort. I wanted to avoid any squeaks of wood on metal so deliberately sized the three ply boards to be 1/4" away from the walls. I don't want these gaps to show with the vinyl so I used Great Stuff Gaps and Cracks to fill these edges with foam. Controlling the rate of flor in order to get a good finish is difficult. Despite a few mistakes early on I think I got the hang of it and the end result once trimmed back was good. I'm concerned that the frequent vibrations in the back of the van might cause this to dissolve over time but it's too early to tell. Be patient and give the foam at least as long as the can recommends in order to fully cure. I was eager and tried to cut flush one section early only to quickly abort. For trimming back I used a cheap caulking spatula. Finally I sanded down the polyfiller and any rough sections on the plywood to ensure a smooth finish for the adhesive and vinyl. 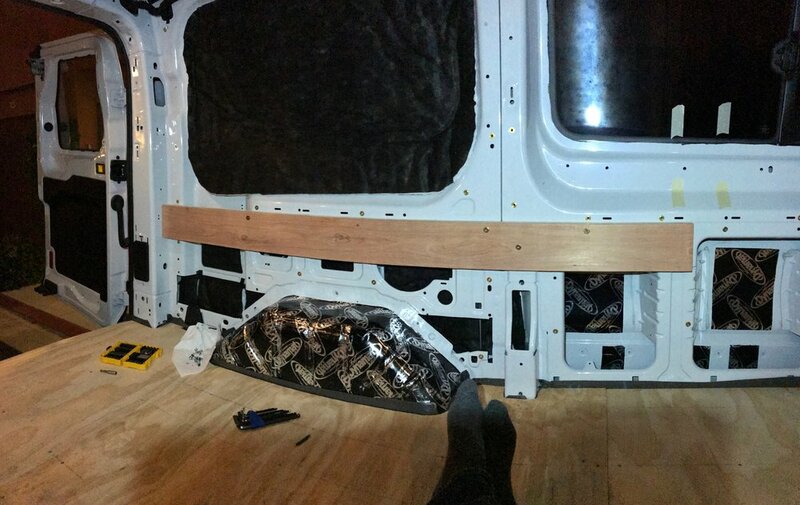 I used a cheap 1/16" square-notched trowel to spread Roberts 6300 Pressure Sensitive Adhesive to the floor of the van. With some effort you can get very smooth regular grooves. I've not used adhesive like this before but I suspect that concentrating on a smooth layer of adhesive really helps improve the finish. moreystransit managed to glue their vinyl in two halves. Unlike those guys I ended up applying adhesive to the whole floor working from the cab to the rear of the van and then rolling the vinyl from the rear of the van with some assistance. This was a somewhat hairy procedure but by balancing on either wheel arch it is achievable with a RWB Transit. Be careful all during the unroll process that everything is square and well fitting. I chose to do this in the evening when it was cooler (maybe 15-18C) so that the adhesive would start to get sticky faster and curing would be sped up. This was a good decision but had applying the adhesive taken much longer I may have regretted it. I suspect half of my time was spent just figuring out how to use the trowel effectively so if you're familiar with this it's definitely a good call. As soon as the vinyl is down use a rolling pill to iron out any minor air bubbles, etc. that might show up. In my case there were just a few and this step did not take long. I used GE Silicone II Clear Caulk all the way around the edges where the vinyl meets the wall. I've heard silicone caulk is more messy than others but it's also the most flexible. Since vinyl can expand & contract with temperature changes (which as we all know can be extreme in some of the locations we visit in our vans!) this makes silicone a good choice. I used a caulking tool (really just a piece of plastic with a curve on the end) to give the caulk a good consistent shape and finish which looks great. Again, I was a little impatient to get to caulking when I should have done more prep removing a few small pieces of gap and crack foam from the walls. This is a visible imperfection at the edges but all areas are still well sealed and my ply walls, bed, etc. will fully cover the edges. Initially I planned (and may still) install either aluminium carpet or step trim at both the rear and side entryway but also where the vinyl floor meets the plastic mat of the cab. To date I've only installed the cab trim which looks very smart. I may forego the rear trim as I found that the vinyl neatly tucks under the plastic step. I discovered this totally by accident so it's unfortunate than just over an inch at the back is too short to fit neatly underneath. If this continues to annoy me then carpet trim will go down. The side entry trim is more tricky than I expected due to the right angles. I probably need to borrow a proper saw that can cut the aluminium at the 45 degree angles I require. I'm writing this post approximately three months after I completed the bulk of the floor (everything except trims). To date the floor has performed extremely well in a few thousand miles of driving. No lumps or bubbles in the vinyl, no issues with the silicone caulk. I don't think I would change anything with the plan, however I do wish I'd been a little more patient in waiting for things to cure, and in cleaning up the few small spots from the foam filler. 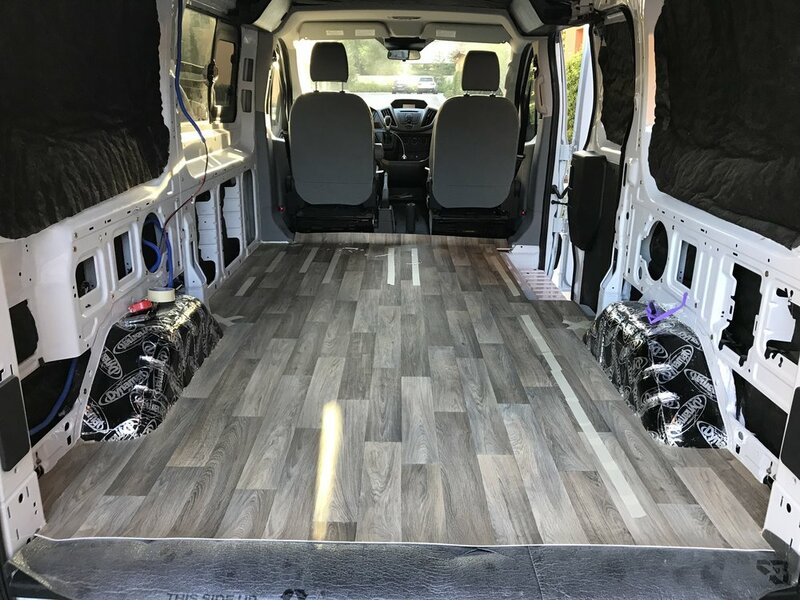 After considerable research into different options for laying my floor I eventually settled on a straight up copy of what the guys at moreysintransit.com did. Van William's cargo conversion. 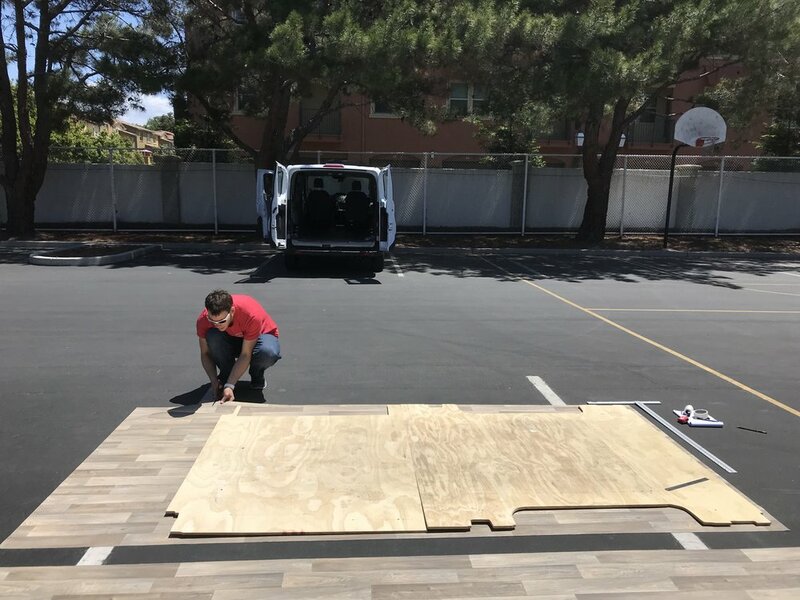 The downside to this method was that he chose to drill into the base of his van to secure the floor, something I'd like to avoid at all costs. Additionally the number of steps (dados, etc.) that he used seemed overwhelming to me as a total novice, although I'm sure these could have been skipped. faroutride.com's floating floor. Their plan (and blog in generally) is totally awesome, has amazing insulation and requires no drilling of the bed. The big downside is the sheer number of layers involved; because my Transit is a low roof model vertical space is at a premium, even if it means slightly less insulation in the floor. Additionally, while cost isn't my major concern, this is not a cheap option! So what are the key design elements of the subfloor I decided to go with? The total cost, weight and overall height is reasonable with relatively few skills required to achieve a good result. At this stage I haven't decided what my top floor will be (vinyl, carpet, hardwood?) or whether I will use metal or wooden carpet trim. Without the stock liner to use as a starting template I instead picked a cheap piece of 8'x4' OSB and scribed the wheel arch onto that. Through a repeated process of scribing, cutting & offering up the cut wood to the floor I eventually got a decent template. That said there were still some areas I'd overcut, so I marked these down on the board so I could make adjustments when transferring to the final ply. I bought three 8'x4' sheets of 15/32" ply ($28.45/sheet from Lowes) and had them cut the long edge to 69" leaving me three 4'x69" sheets plus offcuts to be used for filling the floor ribs. For the piece closest to the cab I scribed a few small areas directly onto the final ply, cut this and achieved a good fit. By overlaying my OSB template I was able to calculate the offset to start transferring my template to the final ply sheet. Being new to all this I didn't manage to get everything sorted in a single day, but I finished up the evening by measuring the gaps between the floor ribs and transferring these to my offcuts for cutting the following day. The following day I finished off the top of the subfloor by cutting out the previously marked up lines for the middle sheet, as well as transferring my template OSB to the final sheet and trimming. The result is a good, tight fit which left just the curve of the rear entryway and the square 60/40 door step to cut which were done quickly. At some point I will need to return to the short rear sheet in order to cut an access hole for lowering the spare tyre. Next up was securing the small offcuts to the floor of the van. For this I used 3M 4200 but unlike moreysintransit.com I found that a single large tube was not sufficient and will need to return to buy another to finish off the job. Prior to laying the sheets I cleaned the rear of the van with a brush and then 91% isopropyl alcohol to remove any grease and accumulated dirt - it had not looked this clean since the day I bought the van! Currently the van is sat with the top floor reinstalled and all of my breeze blocks as well as other heavy items weighing down the floor to ensure a good bond. Once cured I labelled my work, installed a few final strips of Dynamat Xtreme (because why not) and began to prepare for the final installation. With the sub-subfloor complete I rolled out the underlay and cut around my final sub-floor template. This included an approx 2" gap at all sides so that the underlay would raise above the screwed down floor. The awesome 9" professional heavy duty scissors I bought made lightwork of the underlay. Small cuts put at all corners in the underlay to ensure that it can fold up where it meets the sides of the van. With the underlay cut, I laid it down in the van and confirmed that the top subfloor still fitted snugly. In an attempt to keep the subfloor from lifting at the joins I drilled small holes along the edge and cut some dowels. Unfortunately in practice I didn't have enough space in the base of the van to align the two sheets and push them together. 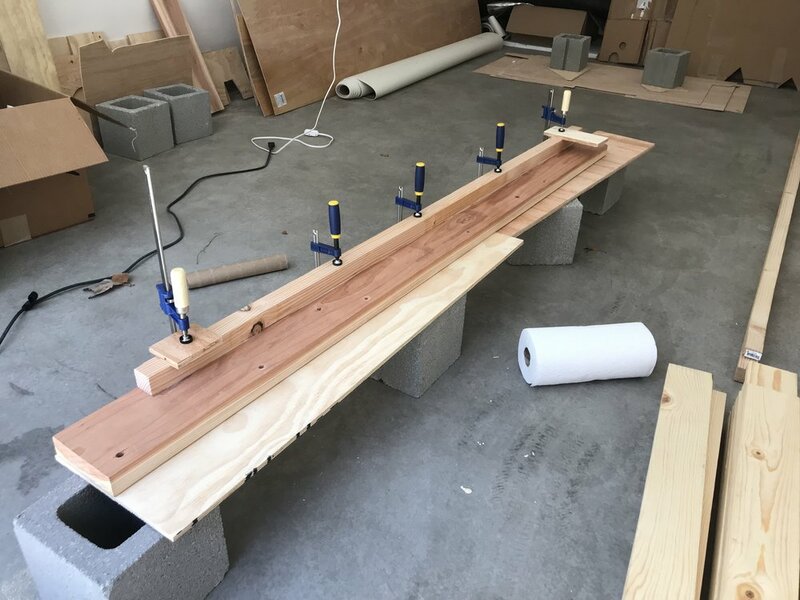 With the subfloor laid I went around and drilled countersunk holes along the pre-marked pencil lines that lined up with the pieces of wood glued to the floor. In hindsight I should have drilled these outside of the van prior to installation to keep the sawdust from getting everywhere. As I began to install the screws I found a few pieces of the glued wood to be insufficient for holding the screws. I believe this was down to insufficient purchase with the short screws (i.e. 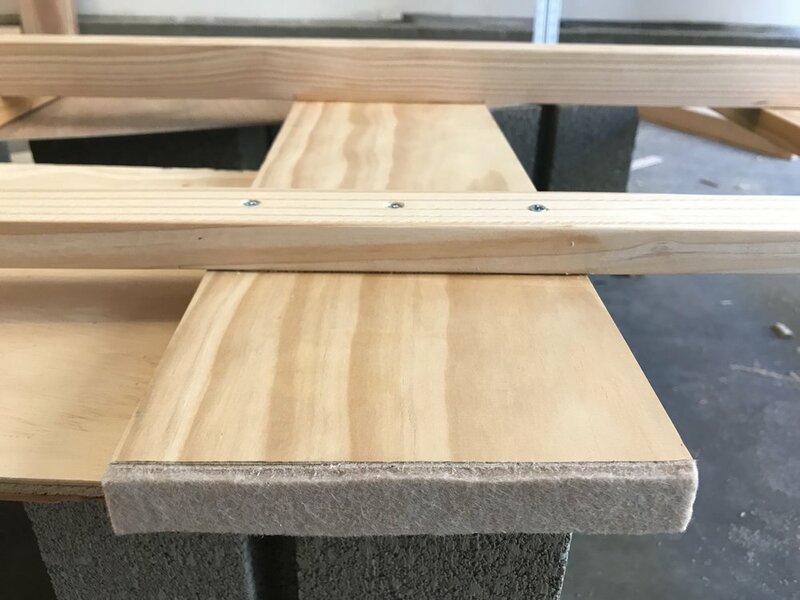 insufficiently countersunk holes to get the required depth) but also just because the quality of the top layer of ply varies along the sheet. In a few cases I had to drill multiple holes to get a good secure screw. Currently this looks quite ugly but in future I plan to fill all of the countersunk holes with wood filler so the end result should still be clean. On a final note there is one small corner of the van (in front of the driver side wheel arch) where the wood has warped slightly and does not sit flat. Unfortunately at this late stage I cannot see a way to resolve this issue so I will need to live with it. In practice I'll be installing a cabinet or similar over this area which I believe will keep the floor flat. Thanks to the great climate in California I'm lucky to be able to cycle to work every day without too much thought about the weather. The van will be primarily used for weekend trips but also as an "occasional driver". Since I'm not living in the van long term the RWB & low roof were compromises to make it more practical day-to-day. I'm into rock climbing, photography (particularly at night), walking and generally hanging out in nice places. This just means that a large living space isn't top priority as I plan to be in the van only to drive places, briefly in an evening after the activities, but mostly to sleep. Therefore it'll be a relatively simple conversion with a focus on the basics: road noise, heat insulation, airflow, light, practical storage & sleep comfort. Perhaps the biggest reason for it being simple is that I have no idea what I'm doing and yet I'm already committed to doing the bulk of the work myself. I've already covered most large surfaces with Dynamat Xtreme. A single "mega pack" contains 9 sheets of 24"x48" which so far looks to have me covered - although at $289.99 it's really not cheap! While there are a bunch of other alternatives (e.g. Roadkill) that run about half the price, Dynamat Xtreme appears to be hands down the most heavily recommended product. These noise isolation products generally require 25-50% panel coverage to significantly cut down on panel vibration. I'll write a more detailed entry later on but it's fair to say that initial impressions are good. Insulation is a double-edged sword. A well insulated van will retain heat through a cold night and keep out the heat during a hot day -- up to a point. In the day the reverse is true - a van left baking in the sun all day long will get hot no matter how well insulated but that insulation will prevent the hot air from getting out. I've come across arguments for not insulating vans at all in hot climates like California, however from personal experience I know that it can still get very cold at high altitudes, with significant wind or in open areas (deserts) at night. Before reading more, please go ahead and follow the previous link as it is without doubt the most comprehensive round-up of different types of van insulation, as well as great explanations of radiation, conduction, convection & radiant barriars that I've found. Armed with some excellent information on the subject I've ordered a 150 sq ft roll of 3M Thinsulate which I hope will handle the whole of my van. Thinsulate generally appears to be shipped by a frequent van conversion forum member called Hein. Again, more detail to come once I've insulated the van, but generally speaking Thinsulate makes sense because it's easy to work with, doesn't require worrying about vapour barriers and has a good but not crazy R-value (e.g. it'll keep me warm in California on cold nights, but perhaps not in more frigid areas). Airflow & insulation are not really seperate topics as they have a big impact on each other. Airflow is key to both keeping a van cool and free of moisture. In the insulation scenario above where a heavily insulated van heats up during the day, massive airflow is one way to quickly exchange the hot air inside with cooler air from outside. A powered fan vent is one way to exchange this air - get back to a hot van in the evening, open the vent and crank the fan. The vent might be left open during the night, optionally with the fan running (on a thermostat) to increase airflow and remove moisture. In our exhaust vent example the air needs to come from somewhere. This might be a cracked window or door or perhaps a dedicated floor vent. Such an idea is something I'm definitely considering as being placed at the front floor of the van (cool air) it would pass through the back and pass out of a roof vent (hot air) promoting airflow. Because it's always open this would work during a hot day when it's not feasible to leave open a window or door due to risk of theft. A standard 14x14" roof vent (powered or otherwise) would not only raise the height of the roof by 2-3" (no more parking in my garage) but would also be an obvious marker of a converted van. A custom sunroof (such as CR Laurence's ridiculous 22"x38" NewPort) has the benefit that it would be largely flush with the roof (and therefore relatively stealthy) but would be unpowered and could not be left open during the day. There's also a pretty hefty cost both in buying the sunroof & having it fitted. Such an option is tempting though as you'd get crazy amounts of light during the day and an opportunity to see the stars or rain while sleeping at night. Standard van layouts often come with rock 'n' roll beds (seats that fold flat at night) that occupy about 4/5 of the internal width as well as cupboards along the side away from the door, often including a small kitchen the fridge, hobs & sink. Clearly these are optimised for day use and while there may appear to be a lot of storage spaces, the ability to stash larger items is limited. I'll be installing a permanent bed at roughly 4/5 width at the back of the van, leaving an empty space at the side to allow storage of larger and longer items. This might potentially include space for a bike, bouldering mat, etc. The bed will be raised quite high from the ground to leave space underneath for storing more large items, likely to be held in large, pull out bins. In future I may look at installing a single heavy duty drawer similar to that in Alex Honnold's van, although this would mean stripping the interior for general cargo use becomes much more difficult. Clearly there will be a balancing act between under bed storage and sleeping height -- I'm not going to be able to sit up straight in the bed but it would be nice to be able to sit up leaning against a side wall. I'm currently aiming for a US full size mattress which is approximately equivalent to a UK double. This will leave approximately one metre of space towards the front. The mattress will be foam, perhaps even from one of the well-known online retailers such as Leesa or Casper (depends on mattress depth). At both sides of the bed I'll install small cargo nets for storing smaller items such as 'phones, wallet, keys, etc. Extending and collapsing tripods can be particularly annoying when shooting subjects immediately outside of the vehicle, so I'll experiment with a simple double loop system so that I can stash them on the ceiling at full extension. Towards the front of the van I plan to have a small set of drawers for storing cook and tableware along with a top surface suitable for preparing and perhaps cooking food. I am not installing running water, a stove or a powered fridge. Most likely all cooking will be done on a small table attached to the larger of the 60/40 doors that will fold down outside of the van with the door open. Any perishable foods will be stored in a cooler box (sufficient for weekend trips). I will install rotating bases to one or both of the cab chairs to increase usable space in the back. A freestanding collapsible table will likely be stored somewhere in the van for use from the cab chairs (think laptops). The table will be freestanding so that it can also be used outside of the van when weather permits. Both the walls and ceiling will be panelled with a thin ply. For the roof I may look at using a low plush automotive-style carpet to help reduce sound reflections inside (this may not be necessary with a large foam mattress). On the free wall at the back (i.e. without an adjoining bed) I may use a thicker ply suitable for installing fixtures to help make the side space more usable. Wall finish is TBD but they may just be varnished and left as-is. Finally the floor will be either lino or a low plush outdoor carpet. At the moment the practicality of lino is winning as do not plan to allow the floor to be removed easily. Initially the van will not have a leisure battery. That said, I will run wiring throughout to allow a relatively straightforward install in the future. The ability to run laptops and use a roof vent fan is quite a compelling reason. Already present in the rear are stock lights. I may or may not expose these but will likely not install my own lights as cheap, battery powered lights that can be centrally controlled from a remote control are plentiful on Amazon. At the end of February I bought a brand new 2016 Ford Transit 150 cargo van. More specifically it's a regular wheel base (130"), low roof with 60/40 side cargo doors. Extra options include cruise control (essential for any sort of long distance driving) and an upgraded 6-speaker stereo with Ford SYNC. Of course it's in a classy "builder's white". This has been a long time coming, having first considered the idea of converting a VW T5 three years ago back when I was living in London. All of the reasons I had not to do this have now gone: driving and parking a larger vehicle is much easier in the US, distances are greater (and the opportunity to drive long distances and stop off on the way at rest stops is appealing), more of my trips will be road trips (no point in owning a van only to end up flying to destinations in Europe) plus I had a little more cash available for the purchase. Prior to the purchase I'd never driven such a large vehicle for more than a day at a time. My previous experience was with small cars (Fiat Punto) and medium sized estate cars on work trips to the US. Initial impressions are good: it's easy to drive, has a great view of the road, is exceptionally comfortable for longer distances and people seem to be more respectful of the van. Plus its cargo carrying capacity has already come in handy while getting settled in California. Over the coming months I'm going to be going through the process of converting this standard panel van into a stealth camper, which I will do my best to document here. Prior to receiving the van I'd done very little planning and I've quickly come to realise just how much more work is involved than I realised. An overwhelming amount of work. The aim for my conversion is a simple, practical camper, without all of the bells and whistles. There'll be no toilet, no shower and (at leas to begin with) no leisure battery, although I do plan to run wires so this is a straightforward option in the future. For now I'm focusing on building out the back with a solid foundation: noise isolation, insulation (although relatively light since it's primary destination is in California), decent floor and nicely finished walls. In a future blog post I'll outline the major steps (as I understand them now) as well as put down my plans for how the interior will be laid out.